I chanced upon a strange jar of honey in one of the shopping malls in Malaysia and stopped by to find out more. Believe it or not, the honey in the jar was green in colour! Like all who spotted the honey, I thought it must be some gimmicky honey product which has some green colouring added to make it a more exciting honey. It also reminded me of an old news report about bees in France feeding on sugar waste from a nearby chocolate factory that made M&Ms and turning some beekeepers' honey into alarming shades of blue and green. The seller was quick to defend that it was an extremely rare green honey which was 100% pure with no colouring added and was produced by green honeybees that built their honey comb underground in the wild. Wild honeybees usually build hives in tree tops off the ground. These green honeybees are not solitary bees like the mining bees (Andrena bees) or the green sweat bees (Agapostemon) which also thrive and nest underground and are familiar to most beekeepers. While solitary ground nesting bee species are not honeybees and do not have workers nor honey production, these rare bees build comb and produce a green honey, which is believed to possess even stronger antibacterial properties than the highly sought after Tualang honey and so far, known to be found only in Malaysia and the Philippines. Not surprising, its price is three times of Tualang honey - approx. 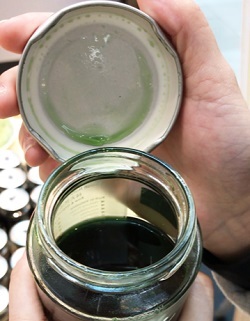 90 USD for a 500g jar, which is about the price of a 500g jar of UMF 15+ Manuka honey from New Zealand. Online information about this exotic green honey is scarce. There are a few short YouTube video clips showing the harvesting of the green honey from underground, like the one I have included below, but overall, nothing substantial on the benefits of the honey could be further established. 3. Wild claims about wild honey in Puzzling Wild Honey Questions. Need Your Help! 4. Yet another rare find from the island of Sumbawa, Indonesia - Is Indonesia's White Honey Real? End of A Strange Find - Medicinal Green Honey. Back to "Truely Unique Honey from Malaysia"